Signed and dated l.l. corner, pencil "M. Preston/ 1923". Signed and dated l.r. corner, pencil "Margaret Preston/ 1932". Antonia Williams, Vogue living , 'Collecting: Petal pushers', pg. 65-67, Sydney, Sep 2004-Oct 2004, 67 (colour illus.). Margaret Preston: Catalogue raisonné of paintings, monotypes and ceramics , Sydney, 2005, (colour illus.). Artworks: paintings 1923. Margaret Preston , 'Transitions 1920s', pg. 61-150, Sydney, 2005, 75. The Sydney Morning Herald , Sydney, 14 Sep 1923, page unknown. 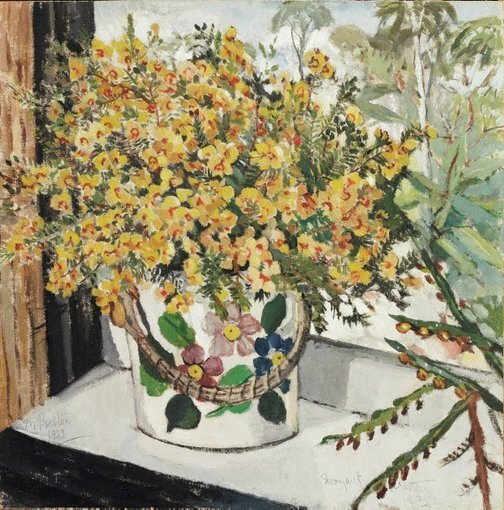 Review of Society of Artists annual exhibition 15 September - 13 October 1923: "Margaret Preston's still life pictures are many and amongst them the bowl of flowers against a strong light (No. 127) is good".